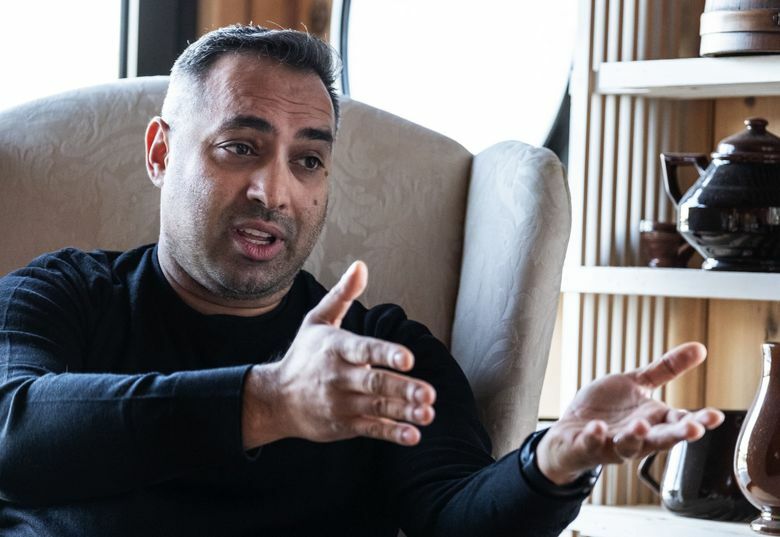 Naveed Jamali — a former spy, naval intelligence officer and MSNBC analyst — is one of seven candidates seeking a four-year term representing Seattle City Council District 7, replacing Sally Bagshaw. Everything had been planned to the second. There were FBI agents seated at carefully chosen tables inside the restaurant, and still more stationed in the parking lot. And just as Naveed Jamali was about to enter, the Russian spy he had been closing in on for three years threw it all out of whack. “Do you mind if we go to a different restaurant?” the Russian asked. Jamali, a civilian spy for the Federal Bureau of Investigation, couldn’t show his surprise, his panic or his worry that weeks of preparation were being completely upended. “Sure,” Jamali told the Russian, walking away from a team of FBI agents who had engaged him in a sting of a Russian operative seeking to buy U.S. military secrets. Instead, he found himself in a noisy Hooters filled with tight shirts and chicken wings and a thousand unknowns. He had to think fast, on his own. That’s a skill he thinks will serve him well on the Seattle City Council, if things go his way. Jamali — a former spy, naval intelligence officer and former MSNBC intelligence analyst — is one of seven candidates seeking a four-year term to replace Sally Bagshaw, who decided last fall not to run for re-election. Jamali, 43, moved to Seattle three years ago with his wife, a research scientist at the Fred Hutchinson Cancer Research Center. (They have two sons, aged 9 and 7.) He is still an active Navy Reserve intelligence officer. “We love it here, but if people like our family are going to plant roots, this has to be a city that can accommodate working and middle-class families,” he said. “This city has done a fabulous job of getting people to move here, but they have to make it so they want to stay here. Jamali thinks there needs to be a better focus on roads, traffic, “the nuts and bolts of running a city,” he said. Jamali is also committed to listening to people — “collecting intelligence,” he called it — before writing any policy. That includes people with opposing views. One of the people Jamali has talked with is Scott Olson, one of the FBI agents he worked with on the Russian sting back in New York, and who has deep roots in Seattle. In Jamali’s 2015 book, “How to Catch a Russian Spy” — which was bought by 20th Century Fox for director Marc Webb — Olson appears as “Frank,” a wry veteran who calms and coaches the upstart Jamali time and again. Olson is now retired and lives in Washington, D.C. But he said longtime residents like his family feel forgotten in the focus on new, wealthy Seattle. It’s the same thing that happened 30 years ago, he said, when there was an influx of Californians to the area. “I think that you have cycles in Seattle livability and we are back to that part in the cycle,” he said. “I think it’s very easy, particularly for a city like Seattle that has been around for 100 years to say ‘We need somebody local.’ And I think it’s important to have somebody local. It all started at Books & Research, a firm owned by Jamali’s Pakistan-born father and French-born mother in New York City, where they were contracted to supply books, manuals and other publications to federal agencies. After Russian military officers started coming in, posing as diplomats assigned to the United Nations, the FBI saw Books & Research as a place where they could find out what the KGB was interested in — and what its intelligence gaps were. As his parents prepared to retire, Jamali took over, and established his own relationship with the FBI. In 2005, he met a Russian intelligence officer named Oleg Kulikov, who, posing as a diplomat, visited the firm’s office with lists of requests beyond the open-source materials and manuals. Jamali suggested they meet outside the office, and Kulikov started asking for sensitive military information, then tried to recruit him. Jamali shared it all with FBI agents, who led him through meetings with the Russian, making him a double agent. It ended when Jamali was “arrested” by the FBI in front of Kulikov, blowing the Russian’s cover. He understands that being a former spy might put some people off. Wasn’t he, essentially, a professional liar? Jamali never lied to the Russian, he said. He would have been able to tell. And lying he said, is a weakness, an additional layer of effort that you have to carry forward. His experience taught him things that he believes will translate to the City Council: The importance of collecting data not only from city employees, but citizens. That means walking the streets, talking to people, looking them in the eye. He goes back to that moment in front of the restaurant, when the best-laid plan was blown to bits, and he had to make a decision, to trust his gut, to act. He would do the same for Seattle, which is changing all the time.